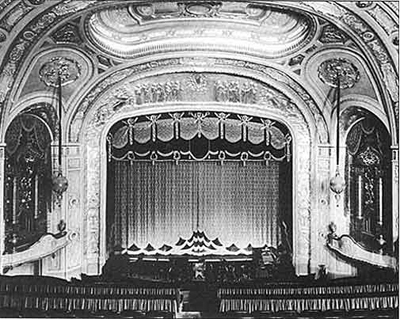 The construction of a “vaudeville movie palace” in Joliet, Illinois was the undertaking of the six Rubens brothers. The Royal Theatre Company was formed to guarantee the 2 million dollar project. 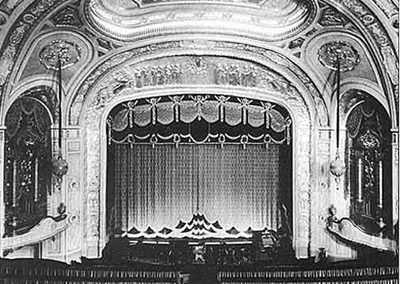 With the opening of the theatre on May 24, 1926, the Royal Theatre Company leased the operation of the theatre to the Great States Theatre, Inc. The property remained under the control and direction of the Rubens brothers. C. W. and George L. Rapp founded the Chicago firm of Rapp & Rapp Architects in 1906. 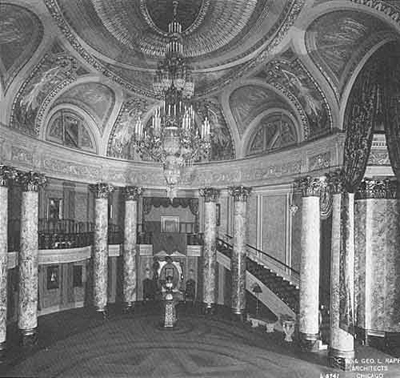 Following the Rialto Square Theatre project, they continued to build ornate theatres throughout the Midwest. The Rialto Square Theatre building was another Kaiser-Ducett masterpiece. Kaiser-Ducett was also the main contractor for many of the exhibits at Chicago’s 1933 World’s Fair. In 1956, Charles 0. Kaiser, son of Oscar, and George G. Nelson took over the firm until it was sold in 1968. The Rialto’s magnificent European architecture is the signature work of the late Eugene Romeo, a Sicilian immigrant who settled in Park Ridge, Illinois. Romeo joined the McNulty Brothers Company of Chicago, one of the largest plastering firms in the country. A sampling of buildings in the Chicago area which bear his work include the Board of Trade, Chicago Daily News Building, Soldier Field, Merchandise Mart, Blackstone Theatre, Wrigley Building and the Joliet Township High School Auditorium. 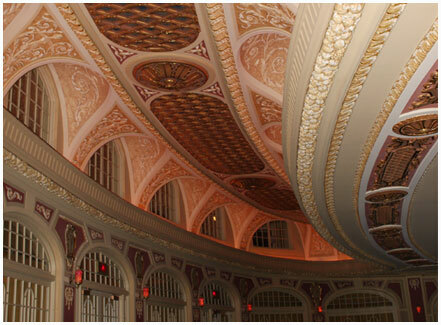 Tour the magnificant Rialto Square Theatre! 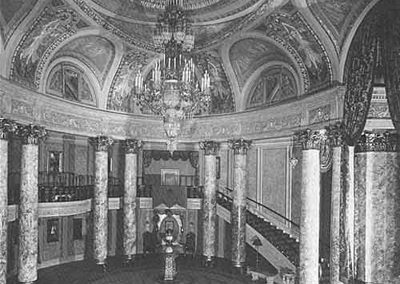 Often referred to as the Jewel of Joliet the Rialto is considered of the ten most beautiful theaters in the nation. 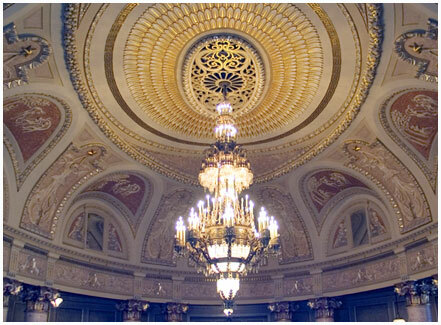 – one of the ten most beautiful theaters in the nation. The building reflects Greek, Roman and Byzantine architecture. Above the main entrance on Chicago Street rises the grand niche – 100′ I”. The esplanade, or inner lobby, is designed after the Hall of Mirrors in the Palace of Versailles near Paris, France. The arch between the esplanade and rotunda area has been carefully copied from the Arc de Triomphe in Paris. 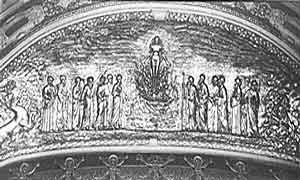 In the center is the head of the goddess Athena. To the upper right of the arch is a symbolic bas-relief, in the form of a dragon, entitled “Labor Fighting the Evils of Today.” On the left side is “Man’s Labor,” showing the harvesting of wheat. The elegant rotunda is surrounded by 18 Corinthian-style columns, and surmounted by a dome very similar to the Pantheon in Rome. The suspended eight-arm crystal chandelier, the “Duchess,” bronze giant of some 200 fixtures, is 20 feet long with 250 lights. The large prisms are of the Marie Therese cut which was popular during the Rococo period. 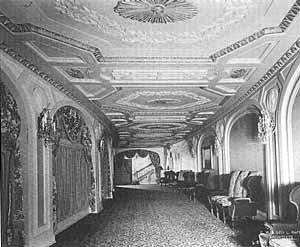 Draperies throughout the theatre were of the early Dufour period. Encircling the rotunda in full view, is the Goddess of the Eastern Star. A full view of the proscenium arch with the grand drape. Organ chambers are bordered by ornate balconies on either side, with pipes masked by glittering floral grills of Byzantine influence. 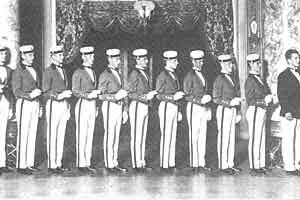 The Rialto’s highly-trained team of ushers, circa 1926. A promenade foyer of dignity and beauty leads to the auditorium and to a stairway to the mezzanine as well as to the Scott Street ground level exit. The Rialto played host to large gatherings while still fulfilling the needs of the theatre-going public. 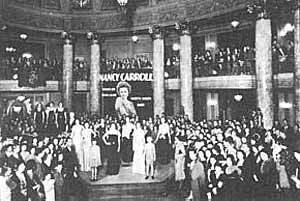 A fashion show with Sammy Berk and his Rhythm Kings, circa 1932, is pictured above. The rotunda’s fountains feature a bronze grille with colored glass backing on a marble base. Each is crowned with a basket of colored grapes, a design repeated in the large chandelier. 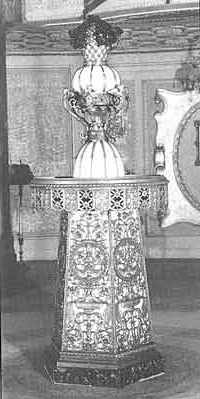 The bowl is encircled with a bronze fringe. The former “vaudeville movie palace” changed its costume to a “performing arts center” on November 27,1981. Actual restoration began in April of 1980. Conrad Schmitt Studios of New Berlin, Wisconsin, restored and renovated the theatre beyond its original magnificence. A campaign to “Save the Rialto” for future generations as a performing arts center was initiated by Dorothy Mavrich, president of the Cultural Arts Council of the Joliet Area, formerly known as the Rialto Square Arts Association. “Save the Rialto” involved the entire community. With the assistance of local businessman, Christo Dragatsis, support was sought from city, state and federal officials. Former State Representative, LeRoy Van Duyne, was instrumental in obtaining the necessary funds for purchase of the properties. The Will County Metropolitan Exposition and Auditorium Authority, a unit of local government, was created in 1978 to own and operate the Rialto Square Theatre complex and surrounding properties. The Rialto Square Theatre is listed on the National Register of Historic Places. The Rialto Square Theatre Foundation is a non-for-profit 501 (c) 3 organization and accepts donations to support the Rialto. 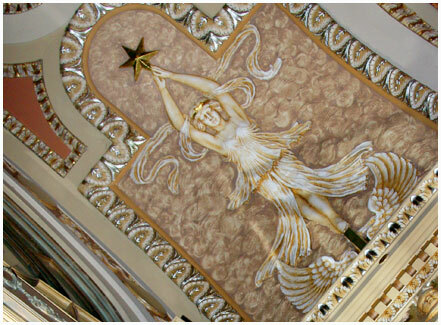 In 2006, The Rialto embarked upon a $5 Million Capital Campaign to Polish the Jewel of Joliet. Individuals and businesses from Joliet and the surrounding community came together with local, State and Federal government to support our efforts and our goal was achieved! The Rialto Square Theatre symbolizes what community pride and dedicated individuals can do to ensure the future of this majestic theatre. Many areas of the Theatre have received improvements as a direct result of the Capital Campaign.